Ill try adding a delay to the raid check to fix the issue, I havent seen this myself, however im usually at < 30ms latency so that may be why. [22:11:08] HeadCount2 (1.0): (DEBUG) Owner is not in a raid and the most recent raid is final. No recovery required. [22:11:09] HeadCount2 (1.0): (DEBUG) Owner is in raid and the most recent raid is final. Starting new raid. [22:11:09] HeadCount2 (1.0): New raid started (12/24/2010 21:11:09). [22:11:15] HeadCount2 (1.0): (DEBUG) The current raid is continuing (Updated: 12/24/2010 21:11:15). [22:11:15] HeadCount2 (1.0): (DEBUG) There currently are 31 tracked raid members. [22:11:17] HeadCount2 (1.0): (DEBUG) The current raid is continuing (Updated: 12/24/2010 21:11:17). [22:11:17] HeadCount2 (1.0): (DEBUG) There currently are 31 tracked raid members. [22:11:21] HeadCount2 (1.0): (DEBUG) The current raid is continuing (Updated: 12/24/2010 21:11:21). [22:11:21] HeadCount2 (1.0): (DEBUG) There currently are 31 tracked raid members. it shouldnt have wiped your raids if you are missing stuff try checking your .bak saved variables file. That last update deleted my raids I had, is there a way to get those back? it shouldnt stop and restart a raid, please turn on debug and send me the chat window output. When I do relog - raid is automatically finishes, and new one is opened, how I can fix this? Veev turn on debug next time you goto loot and tell me if it dumps anything out that would help a lot. 1.) if you wow client crashes and you had not done a reload or changed zones the saved data will not have been flushed to disk. No way around that if the client crashes and doesnt save any data. Addons no longer have the ability to tell the client to saved data to disk. 2.) ill look into a refresh no working as intended. 3.) ill see what i can do i was trying to avoid slash commands that people have to remember for stuff to work. 4.) Ill check broadcasting again i tested locally and it seemd to work manually adding bosses and loot. I havent bene in a raid in cata yet. 1) WoW Client crashed once and all previous information about the raid (Players/Wait List/Bosses/Loot/Attendance) was lost. I don't remember this happening in HC1, but I may have just never crashed during a raid while running HC before. Anyways, if this is unintended then I thought I'd let you know. 2) Loot list refresh - Didn't refresh automatically, have to click to another tab and then come back to see any loot that has been handed out since you went to the loot tab. 4) Did an XML export last night and imported it into Guildomatic. It worked flawlessly! Broadcast loot doesn't seem to be working. I have it checked with guild selected but it doesn't announce anything. Also is there any chance you could release a lightweight mod with JUST the loot announce? Would be really nice. is it giving you an error? I tested that a bit and wasnt seeing any issue. but to export a raid it must be closed. i.e. if it says (active) net to the raid it wont export. Just wondering if it is me or me. Probably me. But I can't export from captured raids. Is this not functional yet? Thank you for the quick response. It works perfectly now. joe gets all the command sent to him on how to add himself to the waitlist. I have been monitoring this addon for the last few weeks and just wanted to thank you for all the work. 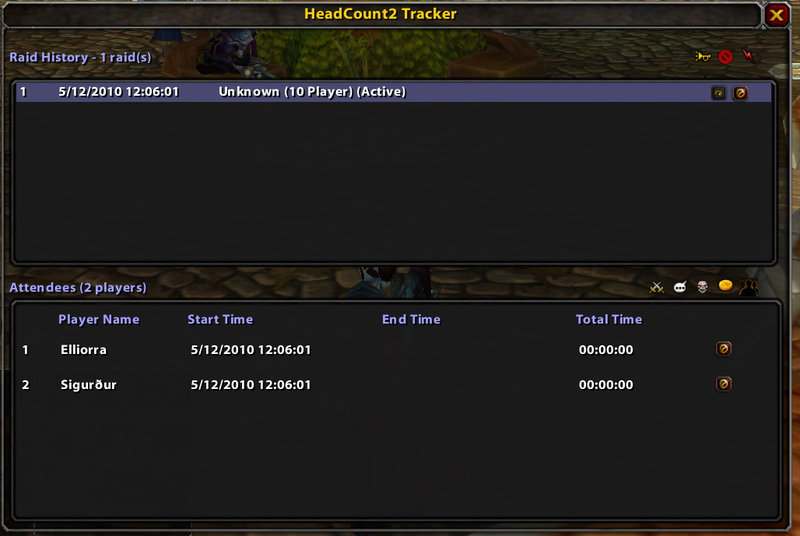 This addon makes attendance tracking for my guild so much easier. The only problem I am currently having is I don't know how to get it to add people to the wait list from whispers. I haven't been able to find any information on this either so any advice as to how to get this function to work would be greatly appreciated. Thanks. 99.9% of everything should now be working i ran some testing in karazahn to see boss kills and loot tracked. ill be adding an attendance summary tonight or tommarrow in prep for cata. Locailzation data will also be uploaded when the last panel is in place.